The Bellmage Kickstarter has launched! I have a tendency to mention that I’m working on things without actually detailing what’s going on! Moving forward with Woolmancy, that will change. So what is Bellmage all about? Bellmage is a 37-page graphic novel about an apprentice bell-crafter who is booted out of the academy with a challenge to make her stone bell ring. Unfortunately she’s yet to have any training. She’s also not sure where to turn now. So like all trainees in a crisis, she bravely… returns home to her parents. Great situation right? Frankly, because I want to. But let me explain. Last year I wrote and published Style Quest. While I still take delight in the story, and think the information is helpful, I really didn’t write it for myself. So this year I decided to produce a story for me. It has silly bits and introspective bits. It has musical notation and footnotes; maps, new languages, fancy endpapers, visual guides and I’m seriously, seriously thinking of adding an endnotes section. In fact, just consider it done. In being excited to work on something that contains a lot of what I love, I excite others. By writing stories about struggles and triumphs I’ve faced, I can bond with and inspire others. I say that’s a pretty good reason. What it is: Think of it as a fancy pre-order system. The book is finished (aside from that endnotes section) so now I’m asking for help to print it. What if I don’t hit my goal? I get nothing, your card doesn’t get charged and Bellmage will be printed in a distant future. Let me be clear in saying that you don’t have to pledge. If you think the project seems fun, or if you want to donate without anything in return, fantastic. I really appreciate it. But if you don’t, or can’t, I really won’t hold it against you at all. Really. 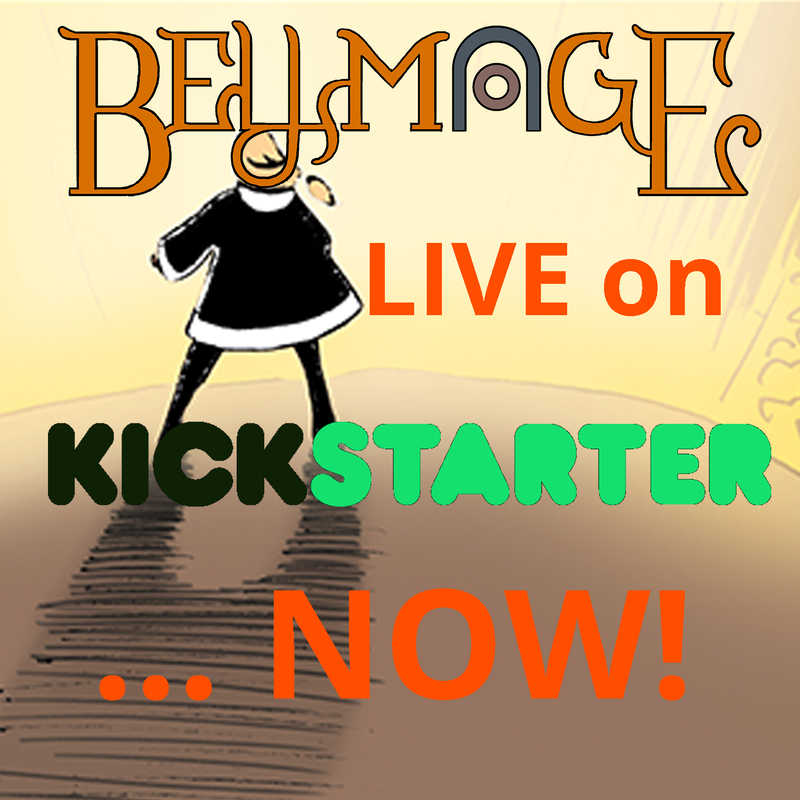 With that being said… Go check out the Bellmage Kickstarter page! Posted on July 22, 2017 July 22, 2017 by Abrian CLeave a Comment on Bellmage Is Coming To Print! The Kickstarter for Bellmage is coming up on August 1st! Getting Blue Cat Co. off the ground as a place where fantastical stories are built and distributed has been an interesting challenge. AND SO MUCH FUN! I love learning, and the fact that there are so many moving parts to creating visual stories and publishing them is daunting, but so rewarding. Let’s talk about the first official tale from Blue Cat Co: Bellmage. Bellmage is a light-hearted journey about the trials of starting out as an apprentice in a clan of magical bellmakers. The story follows the journey of a fresh apprentice who is sent on a quest, totally untrained, and tasked with making a stone bell ring. She must figure out, not only the bell’s mysteries, but her place in the world she lives in. The book runs 48 pages long and is packed with extra notes, bell terminology and explanations in addition to the story. Though it premiered online last year, the art has been redone (in color!) and the story touched up to be a bit more cohesive. From the beginning, I’ve asked for community involvement in picking the story and crafting it along the way. Now I’d love for your help in bringing it to life as well! This is a simple Kickstarter. Just books and a few ways to get yourself into the next comic Woolmancy. If this is successfully funded, you can bet that I have some amazing plans for the next book launch! Stay tuned for future updates and the Kickstarter link!